Producing a voltage by moving a conductor across a magnetic field is known as electromagnetic induction or EMI. It can be found in technological applications such as generators, transformers, and utility locating equipment. Utility locating devices transmit a radio wave at a frequency and this radio wave is electromagnetic. The magnetic field in the radio wave moves across an object and generates a voltage. This current generates its own electromagnetic field. Most of the voltage travels down the outside of the object, such as a pipe or wire, rather than penetrating the inside. Placing a receiver on the ground directly above the buried utilities will detect the electromagnetic field allowing an analyst to locate a metal pipe or cable that is buried in the ground. The distance a signal can travel down a pipe or wire is determined by the resistivity of the surrounding soil and pipe itself, as well as the frequency, transmission power, distance from the transmitter and capacitance of the pipe or cable. Electromagnetic Induction is a technology for locating buried services and is very effective in most soil types. You can locate and trace a facility, as well as estimate its depth. A transmitter is used to transfer an alternating electrical current to the pipe or wire to be located. Then receiver is used to analyse the transmitted signal and localize the position and depth of the facility. The transmitter can transfer the signal to the facility either by a direct connection. 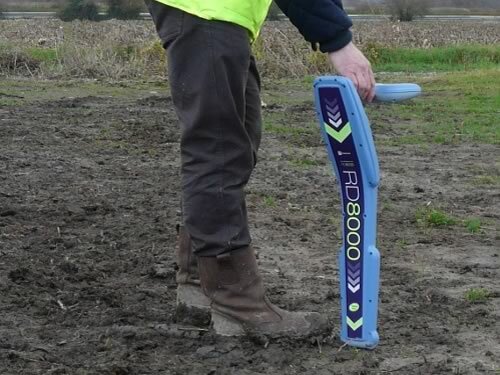 EMI methods can be applied to locate landfill boundaries and cells, contamination plumes, unexploded ordnance, buried metal objects and storage drums, buried foundations, utilities and pipes as well as previously excavated and back-filled areas. Sources of interference include buildings, metal fences, vehicles, buried pipes and cables, large metal objects and overhead electrical wires. While these objects may interfere with certain types of investigations, EMI can be used successfully to map their locations as well. Like ground penetrating radar, electromagnetic induction can be used as a single source for geophysical surveys. EMI is effective in surveying large swathes of ground to detect underground works, reservoirs, buried barrels or pollution, or in order to determine the edges of backfilled zones. EMI can also be used for rapid reconnaissance to identify zones of interest over a large area, after which ground penetrating radar can be used to deal with any anomalies that may be detected. We have been in business for over 7 years and have a team of specialists that knows how important construction safety is. To submit a quote or link your insurance with our services, do not hesitate to give us a call or fill out our online request form.